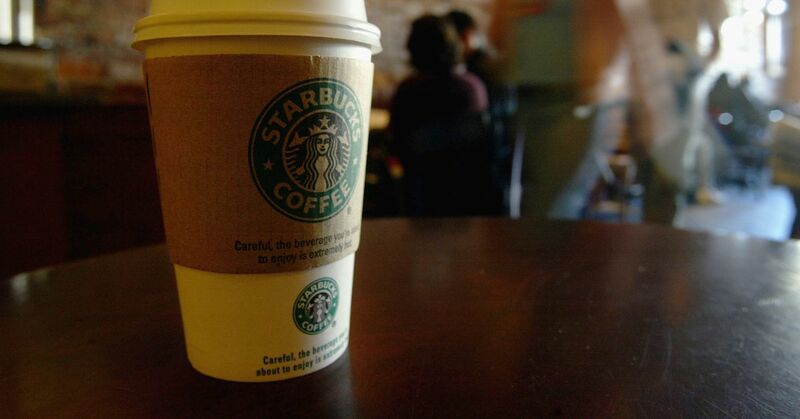 Starbucks drinkers in California may see cancer warning labels on their coffee cups in the future because of a judge's ruling on Wednesday. Oh for the love of Pete. So now roasting or frying or baking plant based foods is a danger? what next? Oh for crying out loud. I never thought I’d see the day of the coffee police. Everything in California comes with a cancer warning. It’s so stupid and so prevalent we don’t even notice the stickers and signs anymore. Everything in California comes with a cancer warning. Many supermarkets, all gas stations, nail salons, many gardening stores, and a myriad of other shops all post warning stickers on their doors. Even basic items such as electrical cords and mattresses carry labels warning of cancer risk. I am not sure of specific food items labeled with cancer warnings. Then again, the food processing and retail food companies and restaurants have a very strong group of lobbyists to avoid such labels, so… we ignore it all. It’s political, not practical. so… we ignore it all. It’s political, not practical. Sure, that’s certainly convenient when I walk into a nail salon. “May cause cancer.” What does that even mean? At what levels? Is it dangerous to people exposed to it every day, e.g., employees? Or the public at large, meaning you “may” get cancer by simply picking up your dry-cleaning once a week? The labels are useless because they provide zero science to back up the assertion. 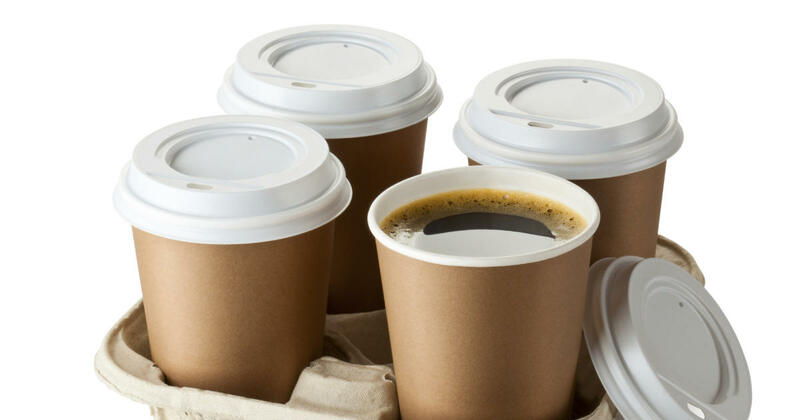 How much coffee will cause cancer? Th warnings don’t say. Yet, I would say that the general population has a decent awareness that eating too much cured meat and red meat is not good. Remember the whole national mood of eating white meat instead of red meat? WHO has already spoken on this. Coffee is something which some people consume in large quality. I know many people drink 3-4 cups a day. Some people may say that we don’t know for sure it will cost cancer, and that is true, which is why it is a label. It can be perceived irresponsible not to provide this warning if it turns out that it is truly carcinogen. I read more on Acrylamide, this chemical is found when roasting coffee beans and the reason of cancer. Problem: I cannot find more info on what cancer this chemical can cause? How many people died from that each year, etc. Besides, why fries, toasts, baked goods etc. have no warning then? Anyway, I don’t think I am worried about this, given the fact that even eating bread you can die, or drinking “heavy metal” water, or eating vegetables with too much pesticides…alcohol is dangerous. Life is short, be merry, enjoy life, don’t get too stressed, and you will live ok.
It’s all about the risk. The risk is much higher, if I get in my truck for an early morning commute, without coffee. There are deer jumping into the road, idiots texting and driving, bicycles and dogs entering the roadways. 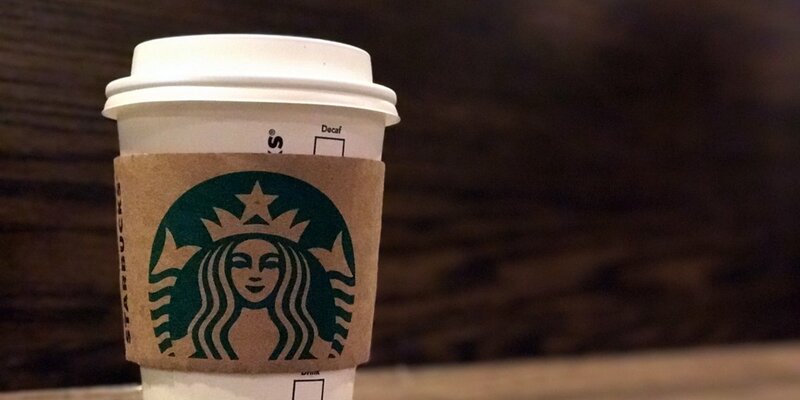 One needs to be frosty; coffee saves lives. Dammit. I’m just getting over the egg and butter thing. I had my first cup of Taster’s Choice when I was 9 years old. I think + 50 years. I’m calling it bs. Bah humbug! The American Cancer Society has a good read on this: Coffee and Cancer I’d add that there are two ways one can reduce risk, if you care: 1. Do not drink very hot coffee; let it cool a bit. Black tea was suspected of causing cancer until it was revealed temperature had a lot to do with the association with cancer. 2. Avoid dark roast coffee. Generally, Acrylamide increases with greater cook times and temperature. Try La Amistad (Costa Rica) medium roast next time you make espresso. Dark roasting does burn off some flavor components. Since coffee is diuretic, do your kidneys a favor and drink a healthy amount of clean, plain water throughout the day. Lastly, do not eat the coffee warning labels, they are carcinogenic. Avoid dark roast coffee. Generally, Acrylamide increases with greater cook times and temperature. 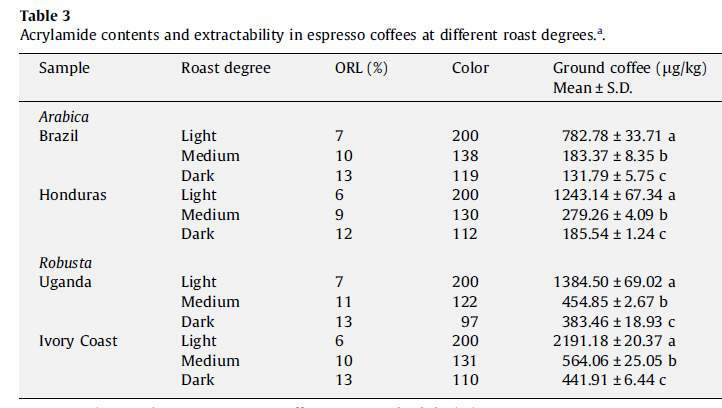 "In a general way, acrylamide levels in ground coffee (both arabica and robusta) signiﬁcantly decreased (p< 0.05) with increased roasting period, for each individual sample. In fact, very high levels of acrylamide were detected in the lightest roasted coffee samples "
Thanks for the correction! I was confusing Acrylamide with Methylglyoxal… don’t ask! Don’t worry about it. I initially thought acrylamide will increase with roast time (light roast will have less) too, but then I started reading about it, and it seems to point to the opposite direction. The argument is that acrylamide forms really quick during the roasting process. Therefore, roasting longer will not create more. However, roasting longer can destroy some.